It takes only several uses to start relying on ecstasy for joy and happiness. But it will take more than several weeks to reprogram your brain and clean your body from the toxic effects of ecstasy. Learn more about recovery program durations and the services they include here. For those addicted to ecstasy, happiness is often created by MDMA. But the high is superficial and fades quickly. And while a person may not be physically dependent on MDMA, the cravings and psychological dependence can affect every aspect of life. So, what can you expect from a rehab? More here on your ecstasy addiction treatment options. We’ll review the science behind the condition and help you understand why drugs like MDMA cause problems over time. So, if ecstasy is no longer working for you…know that you can live a different life! Continue reading for more on addiction and its treatment. We invite your questions in the comments section at the end. Be your authentic self, without the mask of addiction. Treatment can help you start a new life. Operators are standing by day and night. Most of us would agree that ecstasy produces effects similar to amphetamines and hallucinogens. People typically take ecstasy for its euphoric effects, as well as for the warmth and feelings of love it triggers for others. But contrary to what some people may think, people can become addicted to ecstasy. These addictions respond best to professional rehabilitation. Addiction has its roots in psychology. In fact, we generally use ecstasy to escape some kind of emotional pain. And the process of treatment is about getting to the personal reasons you use MDMA addictively. The idea is to unearth your deepest beliefs about yourself and to align them with drug-free possiblities. Recovery is an experience during which you’ll learn more about yourself. However, there is not a general time frame, or a rule about how long should you stay in treatment. Still, the longer you work on yourself in recovery, the better you feel. The benefits of treatment are not only physical. Treatment is build to serve as a mental and above all things a spiritual transformation. Medical detox and talk therapy are there to help you transition to a drug-free state with less discomfort and pain. The opportunity to receive 24/7 day care makes the recovery process more confortable and SAFE. Ecstasy Rehabilitation: How Long Does It Take? Unfortunately, there is usually no easy answer to this question. 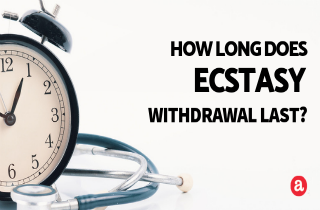 The length of time it takes to complete an ecstasy rehabilitation program will typically depend on factors such as the severity of a person’s addiction as well as how long they have taken the drug. In general, ecstasy rehabilitation duration varies for everyone. However, the setting you choose for rehab has the main impact on the time you’ll spend in treatment. The list below should give you a good idea of the types of ecstasy rehabilitation and duration of each. Inpatient ecstasy rehabilitation requires that a person reside in a treatment facility. Short-term inpatient ecstasy rehabilitation generally takes no more than a month to complete. Long-term inpatient ecstasy rehabilitation is a type of residential addiction treatment designed for people with more serious addictions. This type of rehab can last anywhere from three to twelve months. Outpatient ecstasy rehabilitation is a less intense form of treatment and is usually reserved for individuals with minor addictions, as well as those who have already completed an inpatient program. Outpatient rehabilitation programs can take several weeks to several months to complete. The short-term vs long-term decision should be made with the help of an experienced addiction specialist. Every person has different needs, and an experienced professional will be able to understand these needs and help decide whether short-term or long-term treatment is best. Generally, short-term ecstasy rehabilitation is best for individuals with minor addiction. Casual users who need help to stop taking ecstasy will often benefit from short-term rehab, for instance. Long-term rehab, on the other hand, is usually best for individuals with moderate to severe addictions. This type of rehab involves a longer time commitment and more intensive treatment. Average time spent in drug rehab varies from 3-6 months. However, studies have shown that the longer a person spends in treatment, the more successful their recovery will be. The probability that a person will successfully overcome an addiction drastically increases when he or she is in treatment for longer than three months. Residential inpatient treatment is also preferred over outpatient treatment, although it does require a much more intensive and longer time commitment. Inpatient treatment gives recovering alcoholics a safe and drug-free environment. This helps people focus more on recovery and less on how they will avoid the temptation of drugs. Although ecstasy rehabilitation is a very individual experience, most recovering people will go through the same basic stages during treatment. A common rehab timeline is outlined below. A drug screening and thorough physical and mental evaluation is necessary before a person enters a rehabilitation program. This can take a few hours, and is required to help determine the best course of ecstasy addiction treatment. Ecstasy withdrawal occurs in people who have become physically dependent on MDMA. While rare, ecstasy withdrawal is often very uncomfortable and can sometimes be dangerous. Some people may need to spend up to a couple of weeks in a medical detox facility, where they will be monitored closely by medical professionals. This is because suicidal ideation and hallucinations can be provoked, especially in cases of heavy or prolonged use. The cornerstone of most ecstasy addiction programs are psychological treatments, such as individual and group therapy. The length of time spent in therapy and counseling can range from a month to a few years. Once a person completes an ecstasy rehabilitation program, they will enter an addiction aftercare program where they will attend outpatient rehab sessions each week. These maintenance programs can last anywhere from several weeks to several months. A number of supportive services are available to those who have completed an ecstasy rehabilitation program. You will often be able to get help with transportation, child care services, and housing during and after treatment. For anyone considering ecstasy rehabilitation, time is precious. The sooner a person reaches out for help the sooner they can begin the road to recovery. If you have any questions or concerns about ecstasy rehabilitation time, feel free to leave them below. Your comment will be addressed personally and in a timely manner.